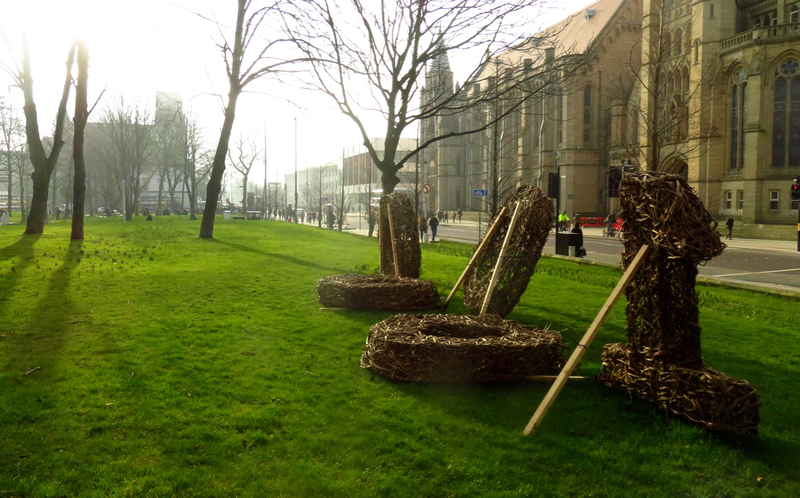 The university have a campaign at the moment around environmental sustainability, and for whatever reason the marketing types see fit, it is called ‘10,000 Actions’, hence these hedgerow digits propped up by Oxford Road. Once I knew I was going to be in Manchester today, this was always going to be the choice, although I did somewhat ruefully notice yesterday that two of the zeroes had fallen down. No matter, it’s the symbolism. I have reached my own big, round number — 2,000 days’ blogging. Every day a photo taken by me, on the day: there has been no cheating, I assure you, no retrospectives. Considering I just set out to do this for a year, I’m chuffed that I not only still have the motivation to keep going, but nothing has yet blown out on me, like a malfunctioning SD card or stolen camera — or worst of all, the feeling that on a given day, there has been simply nothing to photograph. In celebration I have created a new ‘top 20 from 2,000’ page: my own favourite 1%. The stats have been updated too — these are an integral part of the blogging process for me, they are what allow me to notice the quirks and eddies and flows of my life, and how this daily photographing of one or other part of it build up into something meaningful. I don’t pretend to be a photographer — I hope I never have — what this blog is, is an extension of my diary, the visual, image-based journal that I show to the world on a daily basis: but most of all keep for myself. I thank you, though, for following it; likes and visits help me keep it connected to the rest of the world, and it’s nice to know that there are some of you out there who want to check in now and again and make me realise it’s not all gross self-indulgence. Thank you for still being here after 2,000 days. And will I keep it going? Well, each time I think of stopping there seems to be just one more little carrot dangling ahead. Reaching numerical milestones like today is ongoing encouragement, and then looking forward…. over the next seven months I am already down to travel to Japan, the Arctic (twice, including for the midnight sun in June), the USA, other parts of Russia (non-Moscow) and some other new spots as well. Too much potential interest to stop now…. So on we go. Here’s to the third millennium.